With the stupid, never-ending, snow-dumping, blind-rage-producing winter we've had that is still showing NO signs of leaving, I thought it was incredibly inappropriate that we still had to spring forward last weekend. I mean, how mean is that?! SPRING forward? To what? More snow? Ice storms? White-outs? Anyway, after I threw what will hopefully be my last weather-inspired-mini-tantrum, I decided that I'd start faking it until spring decides to grace us with her presence. So, I went to my polish rack to peruse only the brightest and cheeriest colours. Two coats of Monaco on all fingers except pointer, which has two coats of Too Yacht To Handle. Then, I did two coats of magic cake over top, followed by two coats of top coat because the larger, pink hex bits have spiky sides. Monaco came in the March Julep box and it's the prettiest, brightest royal blue of all time. I just LOVE how the neon bits from magic cake really POP out against it. Nicely done, Julep! What are you wearing this week? Link up and show off! Oh man oh man....all the winter! But the springy manicure is so so pretty!! In fact, it's making me think that maybe just mayyyybe I'm going to paint MY nails royal blue today! Also, is it just me or is there no linky tool on your post today? These came out so cute. Love the colors together. SUPER cute! I love the confetti accent, it looks like splattered paint! Where did you get it? I bet it would look AWESOME with black! Wow, Monaco is so pretty! Much better than it looked in the online promos. I must keep an eye out for Magic Cake, love it! Magic Cake, you must be miiiiiiine!! I love the cheerfulness of Monaco. 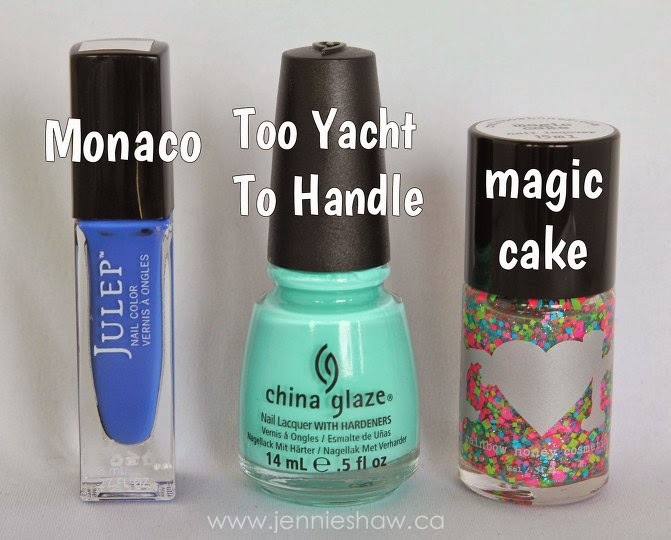 What a fun mani!